If you're in doubt about the size tank you want, we suggest that you read our page on tank sizing. 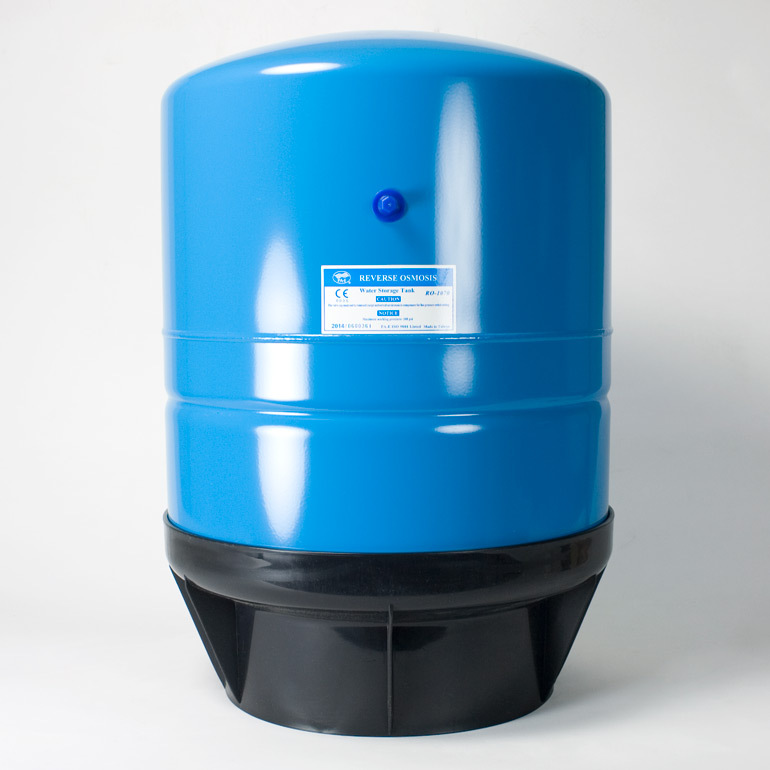 We offer four sizes in standard undersink RO tanks. 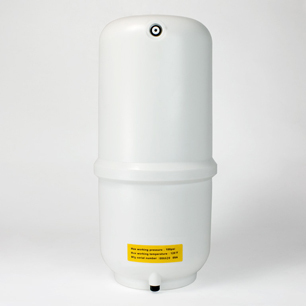 All undersink RO tanks on this page are certified under NSF/ANSI Standard 58 for Material and Structural Integrity. There's also a 14-gallon tank sold here. It's an undersink tank only if a small person can stand under your sink. The four tanks that will fit under almost all sinks are shown at right. 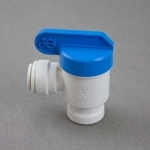 All tanks have standard stem size and can be used with 1/4" or 3/8" tank valves. All can have air added with a standard bicycle pump. All tanks have a maximum working pressure of 100 psi. All are air bladder tanks (water does not touch the metal or plastic outer shell, but rests in a butyl bladder) and all are pre-charged with air at the factory, ready to install. All tanks are sold without a tank valve. If you're replacing an existing tank, your old tank valve will probably work. If you want a new valve, please select 1/4" or 3/8" to match your tubing. Tank Capacity @ 40 PSI 2.5 gal. This size tank is called 4 or 3.2 gallon by most manufacturers. In our tests, it holds about 2.5 gallons. See explanation below. This tank comes with an optional stand and it can be side mounted if desired. It stands on its bottom fine—in fact, it's more stable without the stand. Tank Capacity @ 40 PSI 1.75 gal. This size tank is called 4 gallon by the manufacturer. In our tests, it holds about 1.75 gallons. See explanation below. This tank can side mounted if necessary. This is a very heavy duty plastic tank that won't dent or rust. Fits into very tight spaces. This size tank is called 3 gallon by the manufacturer. In our tests, it holds about 1.75 gallons. See explanation below. This is a very versatile tank that fits into tight spaces. Note that the capacity is the same as TA006. 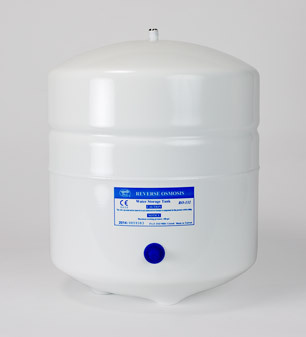 Mid-Sized White Metal Tank - 8.5" X 13.5"
Tank Capacity @ 40 PSI 1.00 gal. This size tank is called 2 gallon by the manufacturer. In our tests, it holds about 1 gallon. See explanation below. 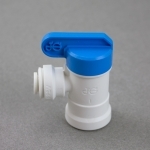 The tank accepts any standard RO tank valve, including the John Guest valves shown on this page. This tank must stand upright. Need an even larger RO tank? 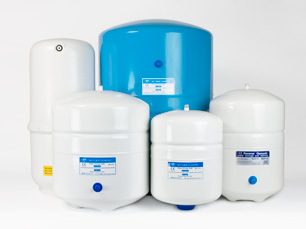 ROPRO (metal) and RO-MATE (fiberglass) RO tanks in larger sizes. 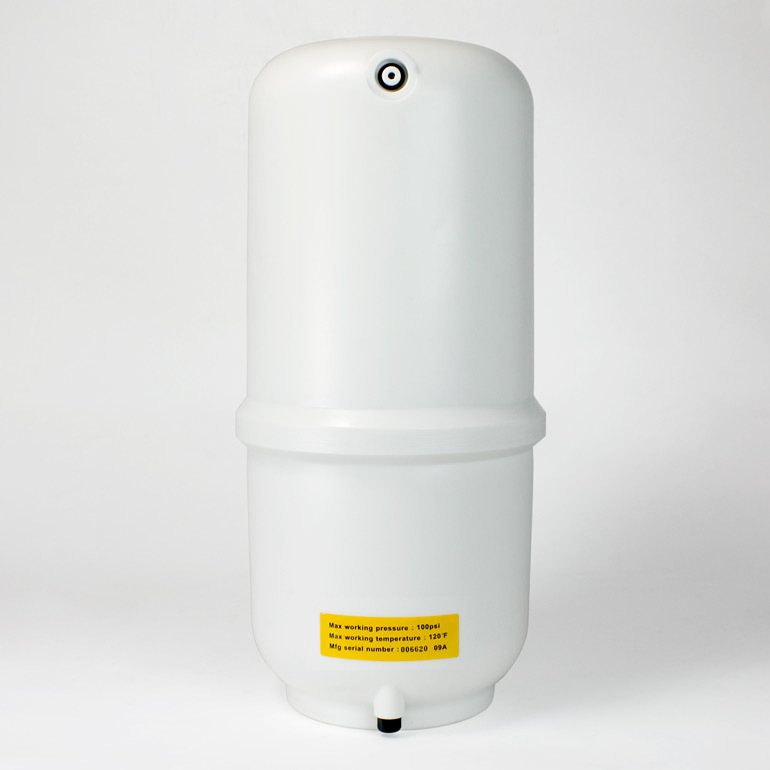 Tank manufacturers are woefully inconsistent about the sizes they put on undersink RO tanks. Two tanks of identical dimensions might be called 4 gallons by one maker and 3.2 by another. There is no clear understanding of what the manufacturer is sizing — the outside of the tank, the maximum amount of water it will hold, or the amount of water it holds under average conditions. To remedy this and to provide a meaningful comparison of the four undersink tanks we sell, we devised our own test of tank capacity. It was carried out (with flawless accuracy) by Roger, our main RO builder. Roger took the four new tanks, rinsed them well, then adjusted the empty tank air pressure in each to an exact 7 psi. He then filled the tanks to exactly 40 psi with water — a likely average full tank pressure for a standard RO unit running on city water. He then emptied the tanks, caught the water, and measured the amount that came out of each tank. The chart below gives the breathtaking results. 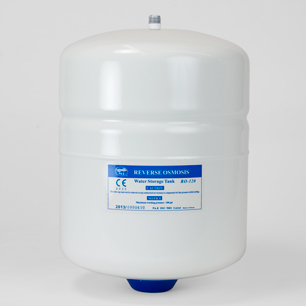 TA005 Standard-Sized White Metal Tank. 11.5" Diameter X 14" High* 2.50 gal. 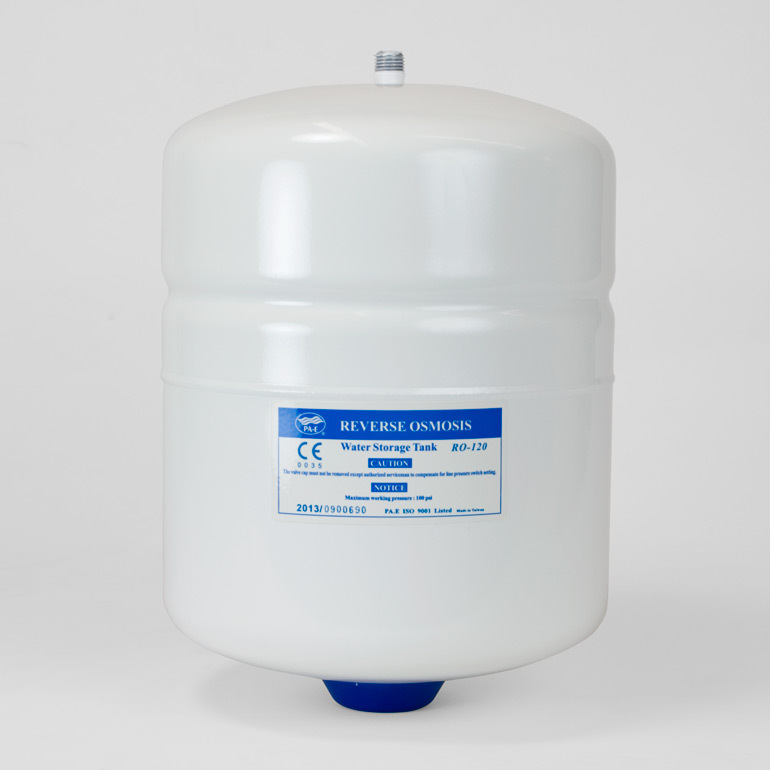 TA006 Flowmatic White Plastic Tank. 9" Diameter X 20" High* 1.75 gal. 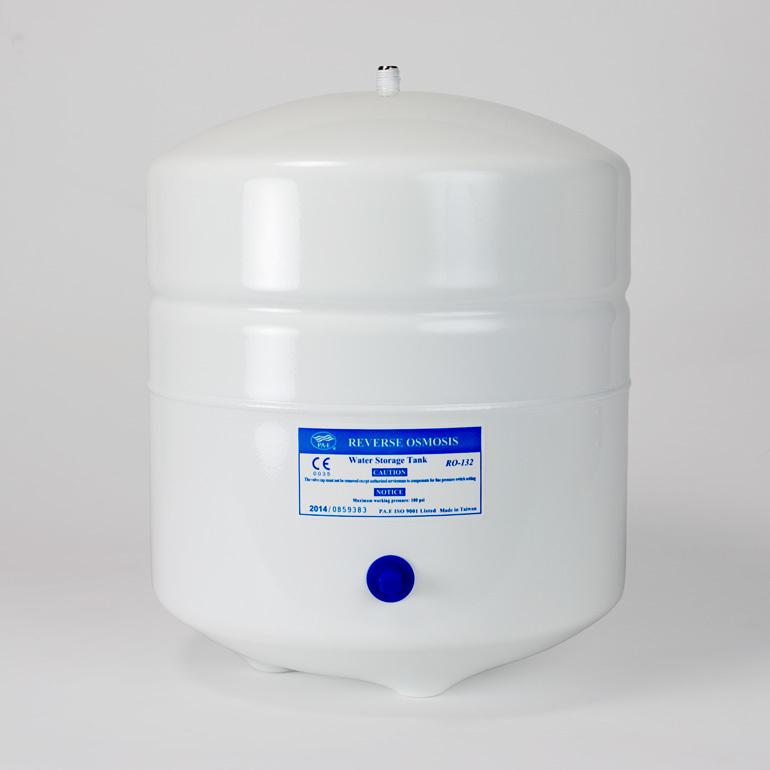 TA003 Mid-Sized White Metal Tank. 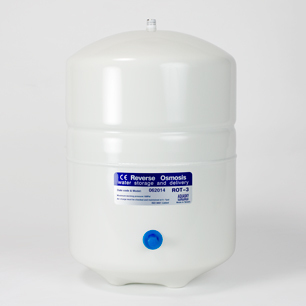 8.5" Diameter X 14" High* 1.75 gal. TA002 Petit White Metal Tank. 7.5" Diameter X 11.5" High* 1.00 gal. * Note: In the dimensions above, height is measured without a tank valve. For metal tanks, the valve adds about 1.75" to the total height. A plastic tank's valve mounts on the side.